Our study, “Understanding Fire Regimes in the Santa Ana Mountains and Laguna Coast,” was released in August 2015. Earlier fire studies conducted in 2009 and 2012 by the Irvine Ranch Conservancy and Hills For Everyone, respectively, provided in-depth information about the Irvine Ranch lands and Chino Hills State Park, but these studies omitted two significant fire impacted areas in Orange County: the Santa Ana Mountains and Laguna Coast. Friends of Harbors, Beaches and Parks (FHBP) thought it important to add to the repository of information about wildfires and ignition points by reviewing 100 years of fire data in these two additional and complementary areas. While wildfires have an historic role in an ecosystem, the acres burned and frequency of fires has increased because of human activity. 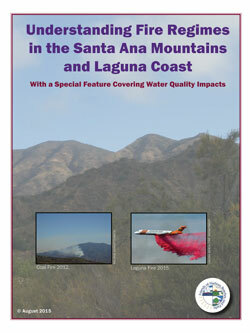 This report outlines the findings for both the Santa Ana Mountains and Laguna Coast. Download the Laguna Coast dataset and/or the Santa Ana Mountains dataset. This publication is copyrighted by FHBP, 2015. Reproduction can occur only with the express written permission of FHBP and credit must be given to FHBP.